I am very excited for Google TV. There is no question that I’ll be getting one of the units (probably the Sony Blu-ray one) as soon as it’s available. I know it’s not the full-on cable-killer I’m looking for, but I see it as a potential way to help wean people off of cable and move beyond the cable companies. We need to kill those guys and their crap service — we’ve been addicted for far too long. So it saddens me to see these latest leaked pictures. 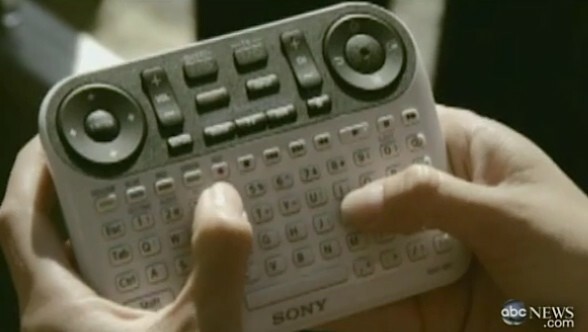 While watching ABC’s Nightlight, Engadget was able to grab some screenshots of a remote for a Google TV device made by Sony. My God, it’s full of buttons. And not in a good way. To me, this looks like an absolutely user experience nightmare for consumers. In fact, I’m pretty sure that I’ve had this nightmare before. Oh that’s right, my current TV remotes have similar button fetishes — just to a lesser degree. Can you imagine your parents trying to figure this thing out? My current TV and cable box remotes are both cluttered to the brim with a buttons. Each is beyond confusing. Sometimes, it makes me want to scream. And actually, the one that controls the cable box sometimes does make me screen — like a baby — as it seems to have been developed by Fisher Price. So Sony has decided to add more buttons? Two circular directional pads, a QWERTY keyboard, volume, channel selection, some play / pause buttons… everything you’d need to rock the web and video all at once. That’s about all we can say at this point, but man does October 12th look even more painfully far away. I just hope that (as has been suggested) that you’ll be able to use a touchscreen device (such as an Android phone) to control the device as well. The last thing I want is for this tax calculator of a remote to be sitting on my coffee table. Yes, Apple’s remote with basically no buttons is awful for text input. But just like the Kindle, most of my navigation on my Apple TV is navigational, not text-based — and the remote is great for that (and the iPhone/iPod touch/iPad Remote app is even better). I get that Google TV is going to be different (they want you to do searches that generate revenue, remember?) and a QWERTY keyboard may make some sense, but there has to be a better way that basically duplicating an Xbox 360 add-on. Or what about Google voice search? We all know they can do that too. Just give me anything but the remote shown above.